Pictured are Jaimie Christian, President of the Dayton Chapter of the Karen Wellington Foundation, and grant recipients Lori and Mark Jones. 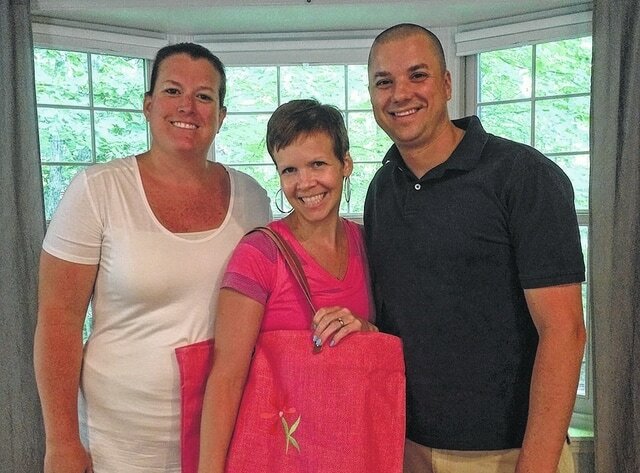 CENTERVILLE — The Karen Wellington Foundation continues its work to make a difference to women and their families who are living with Breast Cancer. The foundation’s latest grant recipient is Lori Jones and her husband Mark. The couple, who live in Centerville, have had several setbacks since Mark was stationed at Wright-Patterson Air Force Base. After moving to Dayton, the 33-year old mother of three preschool-aged children was diagnosed with Breast Cancer in March, 2014. The couple also had to battle a mold invasion of their home which required all the interior walls of their house be torn out and replaced. Lori and Mark will be traveling to Florida later this summer to spend some much needed quality time together as a couple.